Found: One Actual Millennium Falcon Transitional Variant. Inquire Within. This image is from the SOLO, a Star Wars Story art book. 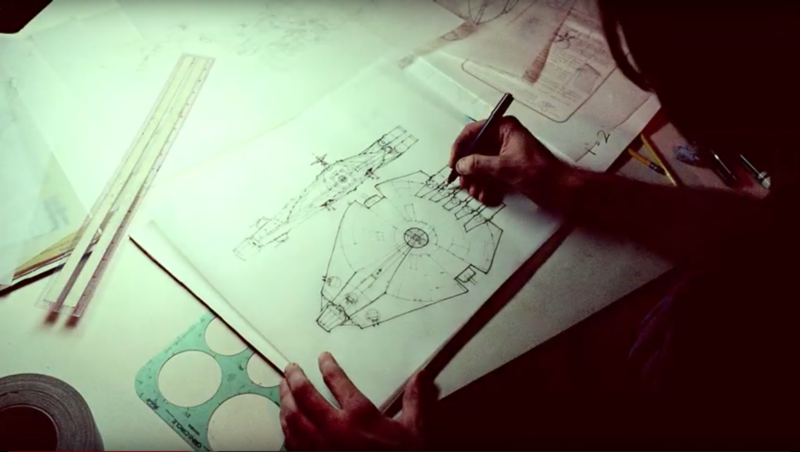 It shows an almost completely unknown variant of the early design of the Millennium Falcon, and attributes it to Joe Johnston. This attribution may be in error, as new evidence has come in since it was published – read on! 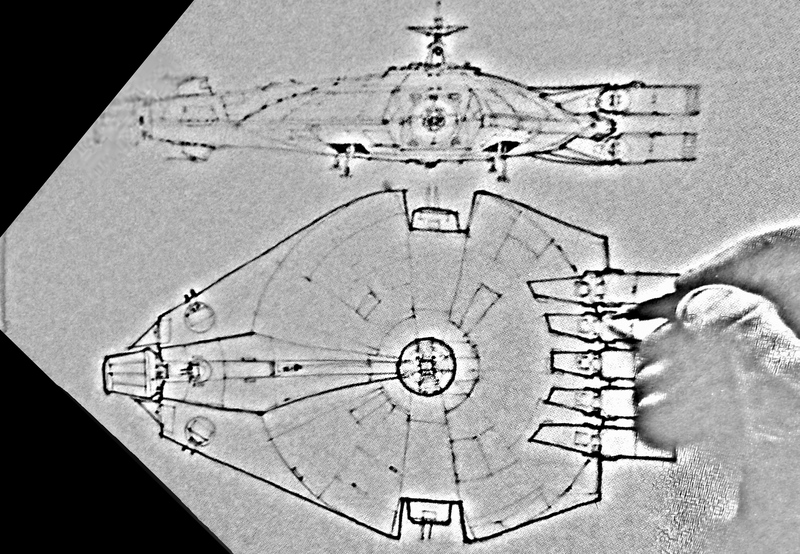 On Nov 11, 2014 this blog published a re-creation of an image seen in the archives of an ex-ILM artist (who only worked on the first Star Wars) of the Millennium Falcon, although a version of it that had never been seen before. Unable to get anyone with the permission to publish that image, we went with a re-creation for the purpose of research. 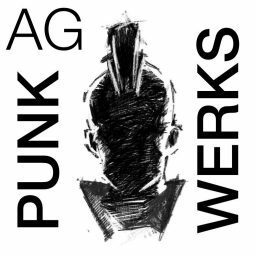 It was one of the first articles in what would become known as VFXarchaeology. Joe Johnston, the designer of the Millennium Falcon, was adamant on social media platforms that this design was not part of Star Wars. Although the illustration in the article was NOT an original Star Wars piece (and never claimed to be so, but was a recreation seen from a passing slide at a Visual Effects Society event). That image, along with the article and research, were the only finger pointing at this design. The Millennium Falcon was the scariest thing to have to revisit. One of the first things I did was reaching out to you, ‘What can we find of anything related to Joe Johnston’s Falcon?’ And you sent me this Joe Johnston drawing, which I have never seen before. 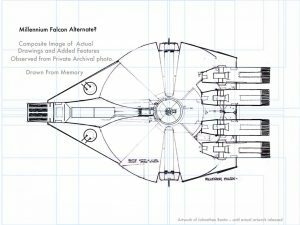 The history of the Falcon was that it originally was the blockade runner shape. George wanted to get away from that after seeing the similar Eagle transporter in Space: 1999, and then it magically turned into this beautiful saucer with asymmetrical side cockpit. That Johnston drawing is the only transitional art I’ve seen. The side view and back is almost the Blockade Runner. It’s like they simply put a saucer on it. You can see how the mandibles were there, but the cockpit fits into the negative space. The picture of Ralph McQuarrie’s hand is fairly compelling evidence, as it is similar to the one in the photo. 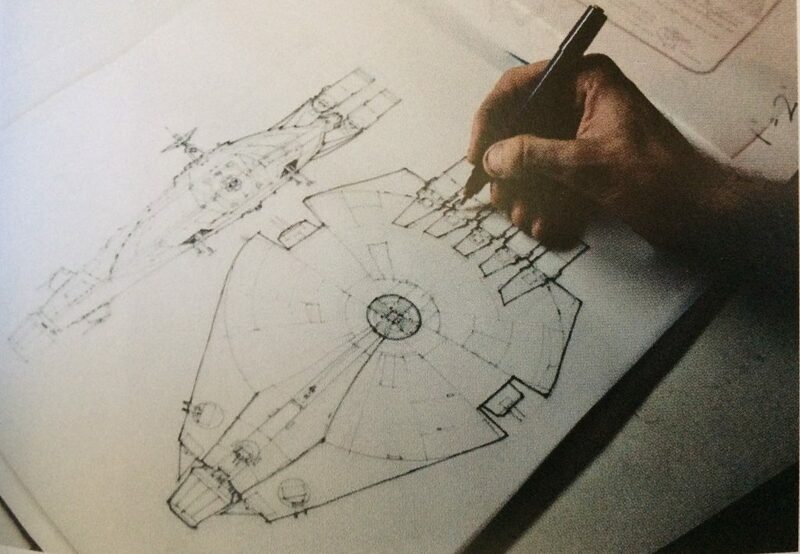 This image coming from McQuarrie’s work may explain a similar variant appearing in an early layout for the Falcon entering the Death Star pre-production art. Nearly one year after this post opened, and more photos show up. This is a wider version of the image (From a Target branded DVD), with the artist at the table — which expressly matches the image that launched the first article. The floppy hair is one of the interesting details that makes one think that it was Joe Johnston drawing — but it was a common hairstyle in the 1970s. As comparison, here are images of Joe Johnston drawing from his Twitter feed several years later, for comparison. Star Wars Celebration 2019 showed an even wider view of the image, and it is even more likely based on this that it is Joe Johnston. 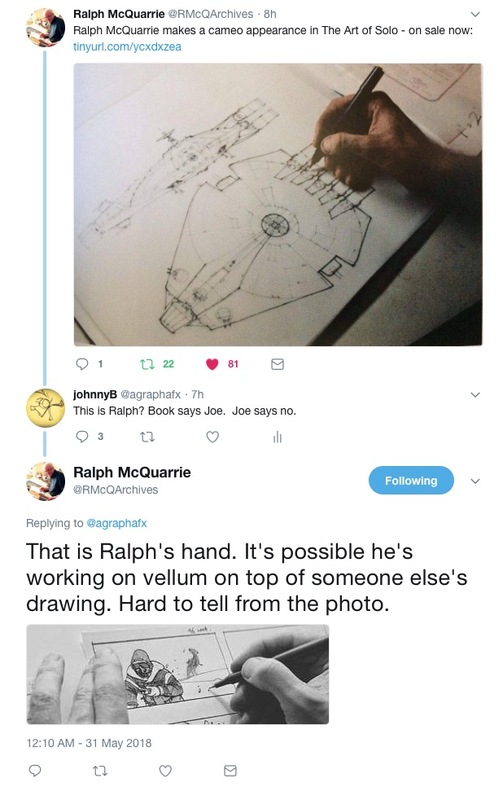 The design is actual, from the Lucasfilm archives, and may not be Joe’s hand (as per his recollection and the Ralph McQuarrie claim— more recent posts from other ex-ILMers have said that Joe did not use that kind of pen). 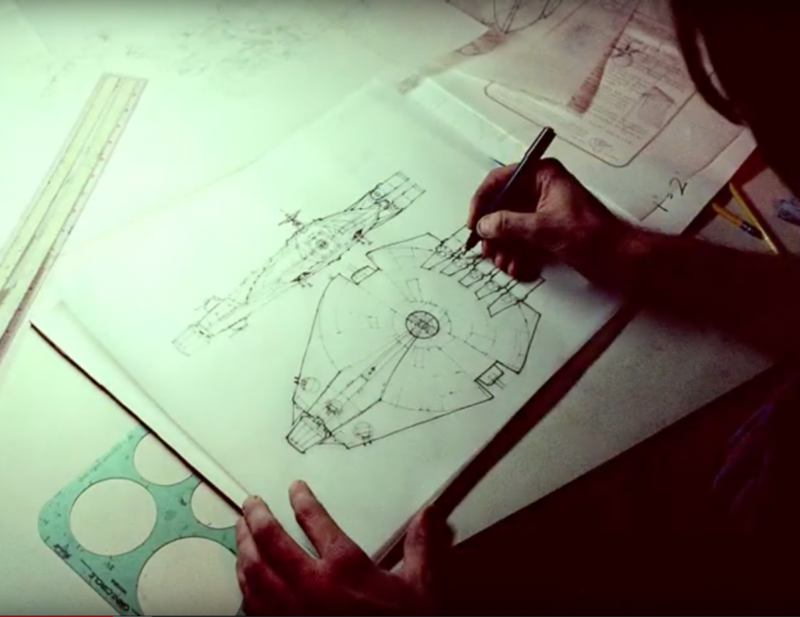 It is interesting that even the actual Star Wars designers for SOLO had the same reaction about the transition of the craft to its current form as we have had upon first seeing this in 2014 (although there were toys with center escape pods in the planning stages for a short time in the 1980s that approach the design). 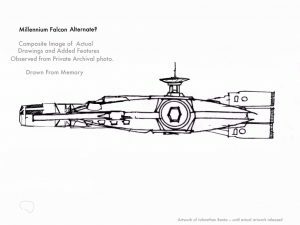 We must consider how deep this image of the alternate Falcon design was buried, and how vast the design archives at Lucasfilm must be. The image reproduced in the book is a cropped version of the one shown as a slide at the VES, as it was an over-the-shoulder shot of the exact same setup — almost a posed photo session. 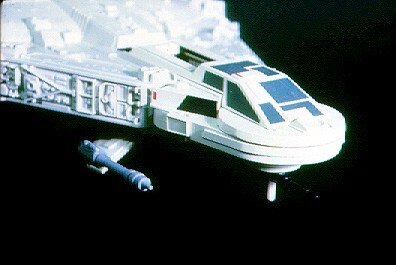 Whether this design was an actual transition between the two designs is another matter, as it may actually be an image drawn after-the-fact for promotional purposes — a common practice for many Star Wars Behind the Scenes photos, or another design done in parallel to help the redesign, which took one week to do in 1976. With a little processing power in Adobe After Effects, it is possible to flatten the image out reasonably well, to get a better handle on the design. As a refresher, here is the original study drawing from memory in 2014, with parts of (most likely) Johnston’s original sketches from other Star Wars art books as the core illustration. Feel free to compare. It may yet be another variant we have not seen. Either way, it is exciting to see the fruit of this research has a real outcome. 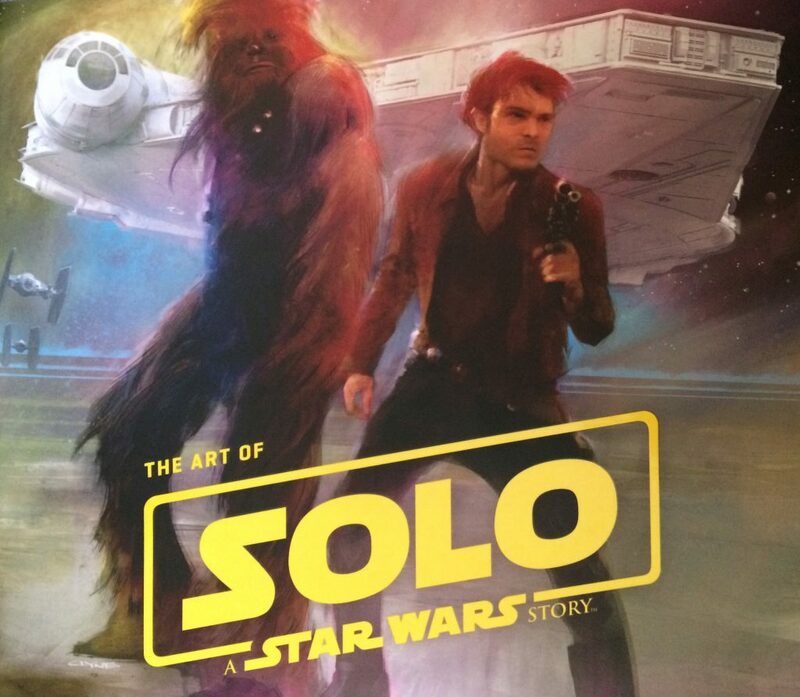 I highly recommend the SOLO, a Star Wars Story art book. Please buy it, to be inspired, and so that more of these books get made. Updated the article to reflect new information about Ralph McQuarrie.